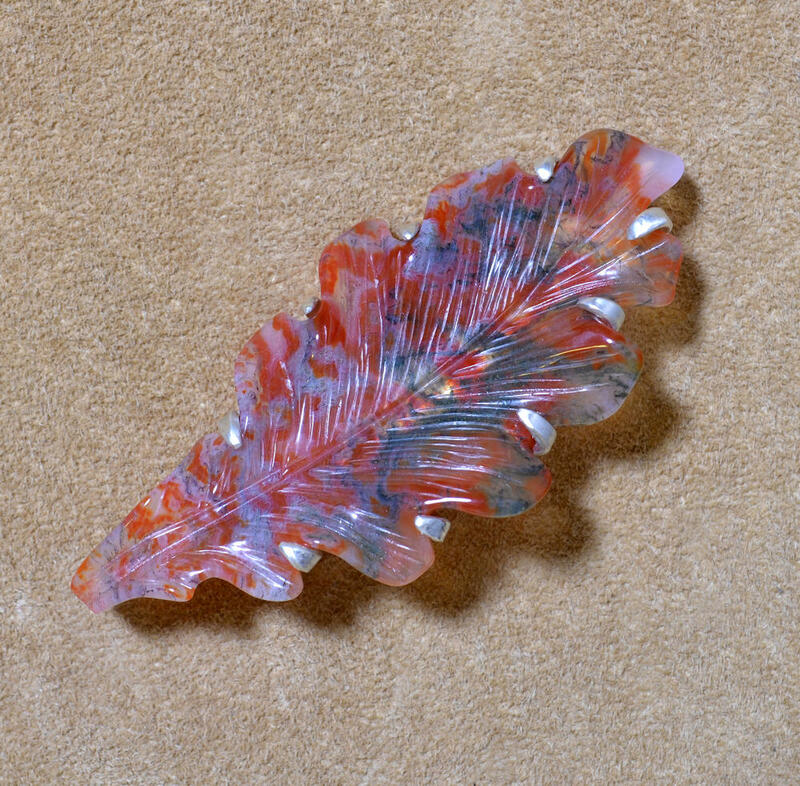 Carved Agate leaf from Grimm Hermann. World-famous German cutters tend to congregate at GJX in Tucson every February where a large room is devoted to their amazing booths. This lovely leaf was all by itself in one vendor's display case. Usually they have lots of similar carvings, but not in this case. 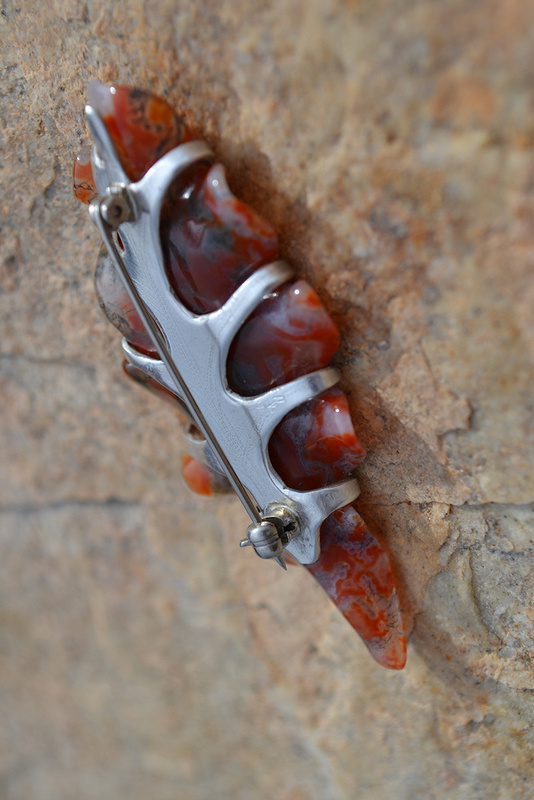 It is "agate" they said, and perhaps due to the language barrier, that was all I could manage to learn. I don't know the carver's name, but do note the resemblance to Greg Genovese's work. He said he didn't cut it however. 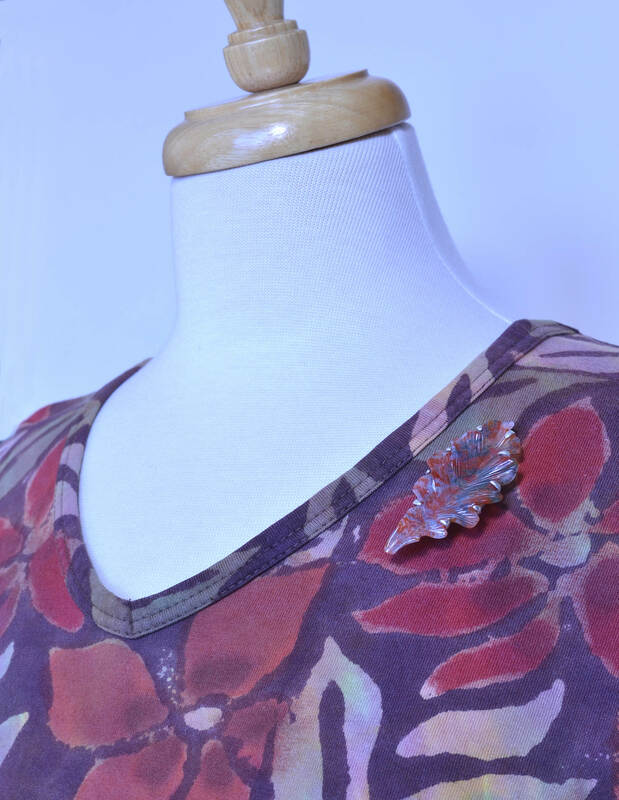 The colors are those of a fall leaf just turning from green to red. 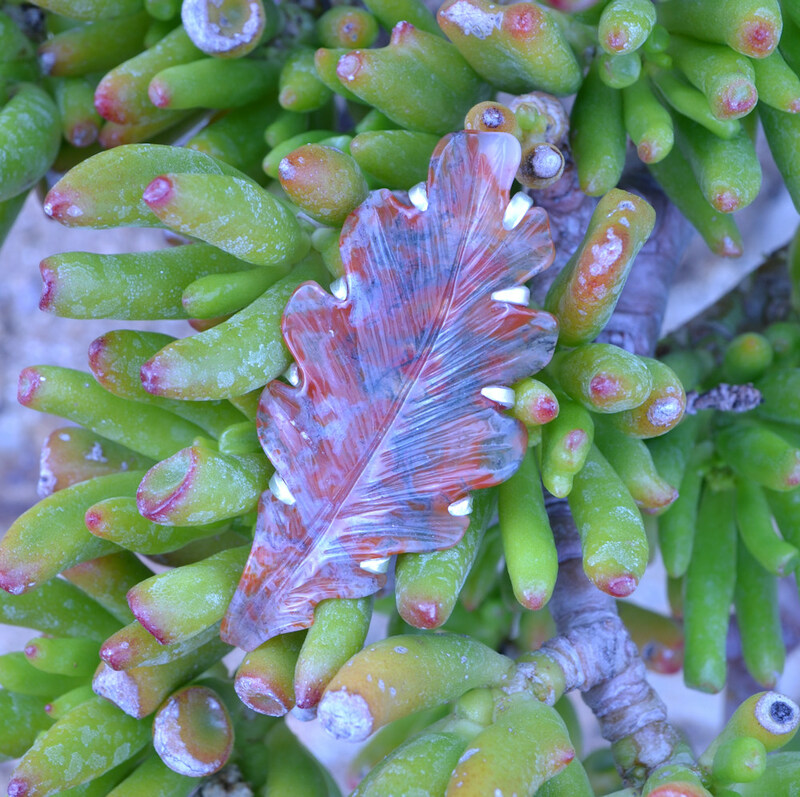 I captured it in a simple, unobtrusive setting so it would look like you picked up a natural leaf to wear as jewelry. 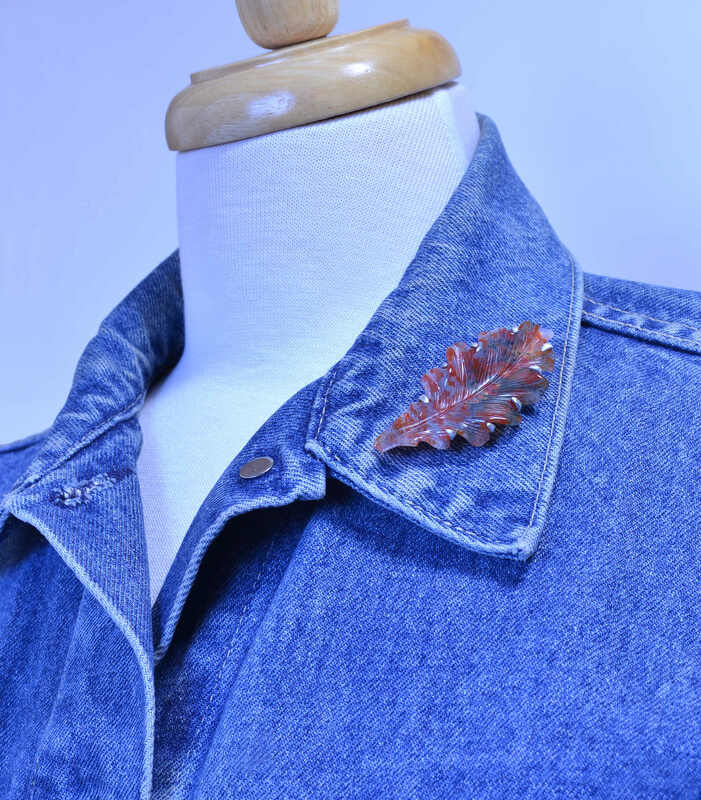 You can wear it as shown, or stem up so the leaf is falling. Either way, its subtle curvature complements the curve of the neck. How I wish I knew what sort of agate this is and where it came from. Perhaps a reader will enlighten me. The patterns include some vague moss and also some vague flames. These terms are descriptive however and don't necessarily correspond to particular deposits. (Pat McMahan gives gorgeous pictures illustrating the various terms used to describe agates in his new book Agates The Pat McMahan Collection below. His enormous book is beautiful and fascinating and mostly consists of agates he dug himself.) The vendor assured me the color is natural and in fact it does not look like it was dyed. This vendor isn't into mass production and I've found some other amazing one-of-a-kind pieces from them over the years, including the strange and wonderful Pink Granite Cross (here). This is an unusual and beautiful carving. Please order it to enjoy with your fall wardrobe or Jeans jacket before I decide to keep it for myself!